Nineteenth and early twentieth-century architectural and travel photographs are themes in the 2017 PHSNE Journal Issue 175. 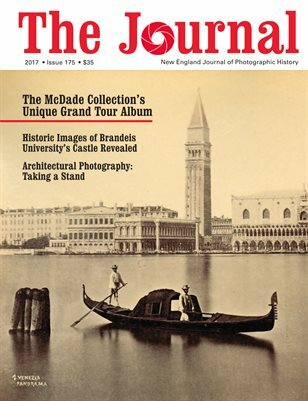 Contents include: "Myself and Her Grand Tour Travel Album," a unique combination of nineteenth-century commercial travel photographs and very early Kodak snapshots, with in-depth research by author Ron Polito; "The Wondrous and Eclectic Brandeis Castle," featuring newly-discovered historic photographs of this iconic structure, authored by Brandeis University Archivist Maggie McNeely; "Taking a Stand on Architectural Photography" an essay by noted architectural photographer Peter Vanderwarker; plus "Boston Cityscapes and the Black Albums," and "T.E. Marr (& Son): Mrs. Gardner's Photographers," both by Ron Polito. 48 pages. Published by the Photographic Historical Society of New England (PHSNE).